Ever think about retirement and wonder what in the world you’ll do with yourself? 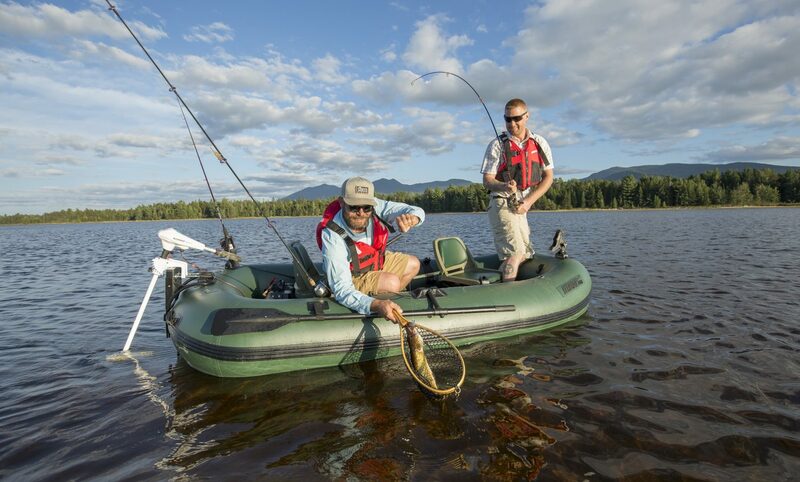 We talked recently with a Sea Eagle inflatable boat owner who’s 20 years into an active retirement and enjoying every minute. Alan and Joanne Hodges, of Kiowa, Colorado, retired two decades ago from teaching professions. Alan had a varied career as a guidance counselor, phys ed teacher, and sports coach. Joanne taught phys ed, too, as well as social studies. They belong to an RV club that gives them reduced RV camping rates and camp several weeks at a time all through Colorado, Missouri, New Mexico, and Arizona. “One of our favorites spots is Blue Mesa Reservoir in southwestern Colorado,” says Alan, “between Gunnison and Montrose.” 20 miles long with almost 100 miles of shoreline, the reservoir is Colorado’s largest body of water and the biggest lake trout and Kokanee salmon fishing spot in the United States. Alan’s enjoyed flatwater fishing at Alamo Lake State Park near Ehrenberg, Arizona, and float fishing in the Taylor River near Gunnison, Colorado. “We camp at private campsites,” says Alan, “but they have to have fishing. Joanne loves fishing and loves to catch fish.” And there’s a bigger attraction, too. “It’s always beautiful, serene, and relaxing out on the water.” An electric motor makes it even more peaceful. “We don’t like the sound of a gas motor or the smell of gas.” And going electric gave the Hodges access to the many lakes that ban gas outboards these days. They recently replaced their SE9 and upped the ante with a Sea Eagle 12.6SRRIK – a Sport Runabout. They wanted something a little bigger and felt, “a 10-foot boat isn’t quite big enough.” How big could they go without having to trailer a boat? Alan took out his tape measure and figured out how much the 12.6 SR would hang over the back when strapped down. It all worked. “While preparing our Sea Eagle 12.6 SR for fishing in Paradise Lake located to the North of Phoenix, we saw a boater at the launching ramp who could not get his boat motor started, and could not get the boat on the trailer since the wind was blowing him away from the ramp, and precariously close to the rocks lining the ramp. Alan and Joanne’s tale is proof: RV’ing, Sea Eagle boating, and fishing really are the ideal retirement combination! Do YOU have Sea Eagle boating photos or stories to share? Hundreds and hundreds of our blog visitors eagerly await them! Submitting photos and stories is easy –just email our blog editor. I continue to talk as many people as possible warning them that in 3 years, the gule you use dries up and the seams fall apart. Your responce to my problem was that you would sell me another boat at a 10% discount…..gee thanks………. The Hodges enjoy life like we do……….plenty of RV’ing and Sea Eagle fishing! We normally camp about every two weeks or so and haul our SE8 in the back of our Tundra so we can pull our trailer! Had a great day at Floyd Bennett Field in Brooklyn, NY with my Kayak SE 330. It was very challenging, do to choppy waters of the Ocean. got a great workout. I had a great day. Craig, I don’t know what kind of boat u have but we have a Sea Eagle 330 and have owned it for about nine years and it still looks as good as it did when we got it. Of course being fold able we keep it indoors when we’re not on the water. Good luck in the future. Do you all notice that this Craig dude posts a negative comment and then you never hear from him again? Kinda chicken sh*t of him (hit and run & hide) I’m guessing that this person is really someone from one of the companies in competition with SeaEagle trying to slander SE and/or if he/it really has a defective kayak, that is is a different brand name. Come on CS, give it your best shot. And it would also be nice to hear from a Sea Eagle representative, who would put out a response or comment on this blog. However, maybe they are taking the “high road” and are letting this dude sink in his own bucket of slime. Thanks for hearing me out. John, I also had the 330. It was possibly the batch of glue they used that day, but the seams all let go. I understand that anybody can put out a defective product for a number of reasons, but what irritated me was that Sea Eagle simply did not deal with the issue with me. Offering to sell me another boat was not an appropriate responce in my opinion…. Craig do you have pictures you could post? Keith, No, I’m sorry I don’t. After talking with the mfg. I was soooooo disgusted, I cut off the D- rings and threw the rest away. The seams simply fell apart. There was no gule resadue apparent. It was like the joints were cleaned for glueing. I couldn’t determine if you had a 330 or some other model. You mentioned that you had a 330 but then referenced d rings. The 330 and 370 do not come with D ring and Sea Eagle doesn’t recommend installing D rings on the sport kayaks. I am fairly certain that the seams on the 330 and 370 are electronically welded. There shouldn’t be any glue for the seams. The PVC is fused together with heat. Where did the seams let go? The floor? These boats are pretty tough but you have to be careful when in the hot sun because the air pressure will increase which in that case you have to let a little air out. I also try not to sit in the boat when it is out of the water because it puts more pressure on the seams. Maybe you just got a bad one. Sorry to hear about your problems. I think I will try the Fast Track next. These boats are more durable and faster to paddle.